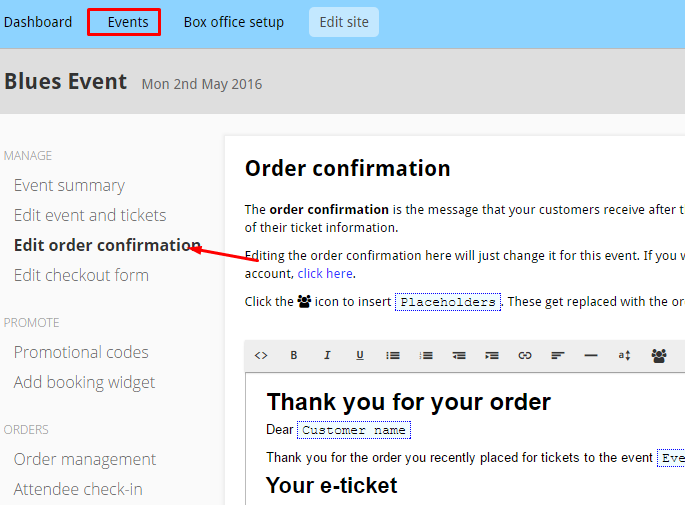 When a customer successfully places a ticket order for your event, they will receive an order confirmation message on screen and via email. We have a default template for this message but you are free to customise it if you wish. This can be useful in situations when you would like event attendees to bring addition identification or other articles with them to a venue. 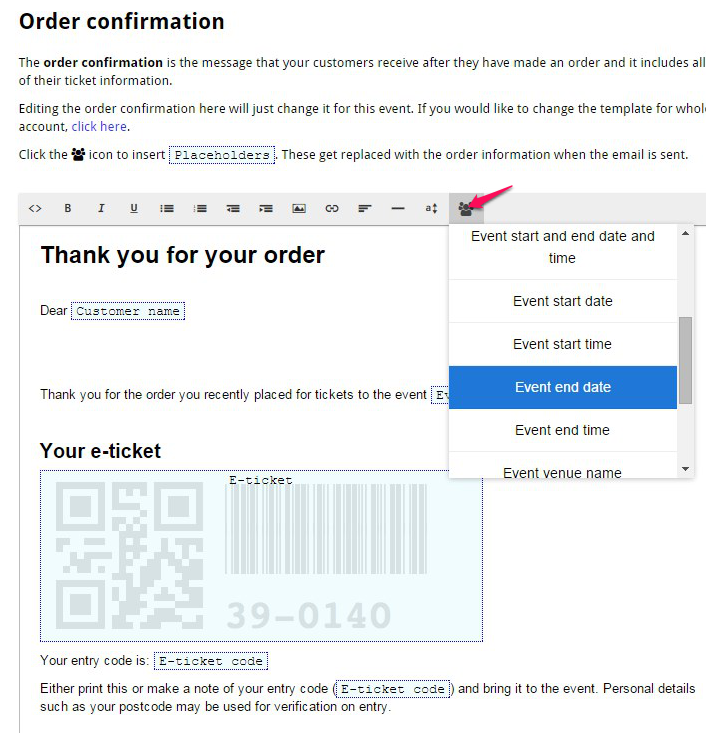 There are two ways of accessing the order confirmation template: you can change the general template for all events or the individual template for a single event. To access the general template for all events, go to “Manage my events” click the ‘Box office setup’ tab from your control panel, then click the ‘Order confirmation’ tab on the left. From here you can customise the email that customers will receive by default. To access the individual template for a single event, click the ‘Events’ tab from your control panel, select your event, then click the ‘Edit order confirmation’ tab on the left. Note that when you change the template for a single event, those changes will automatically override the general template for that event. If you have an event that requires a specific message then this is the place to set it. Placeholders allow you to automatically insert relevant information into your confirmation messages. To insert a placeholder, first place the cursor where would like the placeholder to be, then click the placeholder button from the toolbar. Choose the placeholder you would like to add. 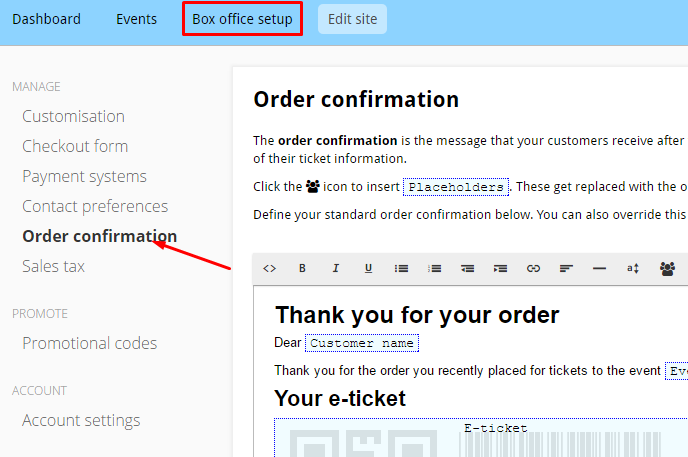 Remember that you can always reset customised order confirmations for individual events back to the default Box office version. The option to do this is at the bottom of the ‘edit order confirmation’ page.